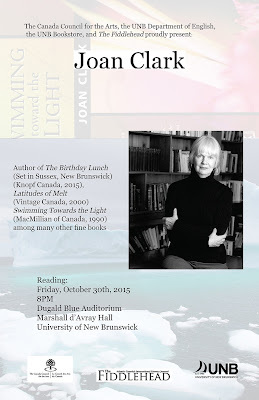 The University of New Brunswick's 2015 Reading Series invites you to a reading by Joan Clark on Friday, October 30th, 8pm, at Marshall d’Avray Hall in the Dugald Blue Auditorium in Fredericton. Admission is free and all are welcome to attend. Clark’s most recent work is The Birthday Lunch, a novel set in Sussex, New Brunswick. She is also the author of the novels Latitudes of Melt, The Victory of Geraldine Gull, and Eiriksdottir, as well as two short story collections and several award-winning novels for young adults. Born and raised in Nova Scotia, she has lived in various places across Canada. 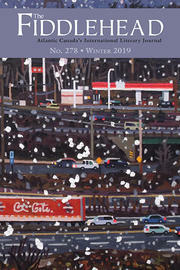 Together with Edna Alford, she began the literary magazine Dandelion.